Explore World Geography Through Art! It's a big wide world out there! Help your child appreciate and learn about different cultures and countries through art with the book, Global Art: Activities, Projects, an Inventions from Around the World. If you are a parent, teacher, and/or administrator award-winning publisher, Gryphon House, should be a "go-to" source for educational resource books. Expert authors and educators have shared their expertise and ideas in over 20 categories of resources. As a parent and educator, you can be assured that Gryphon House produces top-quality resources when your library bookshelves are full of them. Perhaps you have come across Story S-t-r-e-t-c-h-e-r-s, The Encyclopedia of... Series, Mudpies & Magnets Science books, etc. etc. 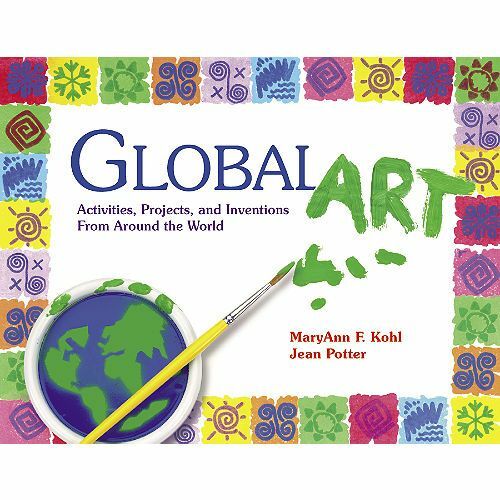 As part of the SchoolHouse Review Crew, I am pleased to share with you my experience and thoughts on another one of their great resources, Global Art: Activities, Projects, and Inventions From Around the World by MaryAnn F. Kohl and Jean Potter. It retails for $16.95. Global Art is just that-- a resource full of art experiences from different countries and/or cultural groups. Whether you are naturally inclined to do craft-y type activities with your child and/or class or not, I think you will be thoroughly pleased with the organization, instruction, and activities within this resource. The activities are broken up by continent. Each continent has well over 10 activities to complete. This book is such a fun way to explore world geography! The book does not specify an age range, but rather focuses on skill and ability. With help from me, my two year old daughter was able to complete some Level 1-starred art projects that involved painting. Level 2- starred projects are for artists with some art experience and Level 3-starred projects are for the more experienced artists. Thus you can pick and choose what you think your child is able to do. What I love about this resource is that you could either have a simple "art" day and pick a geography project to do on a whim or use one of the activities as an extension of something else you are learning about. For instance, learning about Ireland? Open Global Art to page 90 and do a Sprayed Shamrock Stencil activity. Have a child interested in Russian inspired Matryoshka Dolls? Open Global Art to page 100 and make your own Matryoshka Doll Boxes. Learning about penguins and Antarctica? Make a White Sculpture. And SO much more! The world comes alive through art! One activity we did from the book came was "Soft Coral Watercolor" inspired by the island of Tavenui of Fiji; It was the perfect art go-along after reading about oceans and coral reefs for science! The "Did You Know?" fact shared that "Tavenui is known as Fiji's Garden Island and is now a famous landmark for scuba divers because of the vibrant coral reefs (pg 145)." Using watercolor and permanent marker, we made our own Coral Reef. My 2 year old and I worked on this together, while my 6 year old completed it all on his own. Another day I invited my children to create a "Calder Mobile" from the North America art section. We did it a little differently from the instructions in the book because it called for telephone wire?! Which I would assume could be swapped out for jewelry/ craft wire, but instead we used pipe cleaners because that is what I had on hand and it was a bit more tot-friendly. I can honestly say I have nothing negative to note about this resource other than I wish I had it during our past two years of homeschooling! It would have been a great resource to go along with our Five in a Row studies as we learned about various countries around the world during our "rows"! And it is definitely a resource that I will keep readily available on my bookshelves. Please check out what other Crew Members are saying about this and/or The Homegrown Preschooler below.